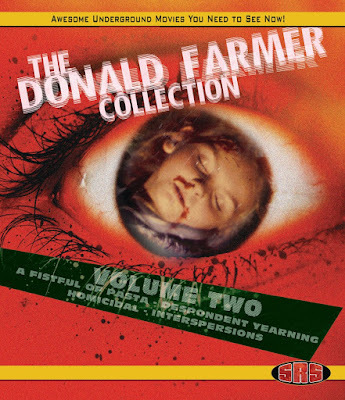 SRS Cinema's "Donald Farmer Collection Vol. 1" was a quiet hit for the company last year, and scored with fans of the underground filmmaker. So a "Vol. 2" made complete sense, once again coming from 2k transfers from Donald's original Super 8mm shorts from the 1970's, and once again only available on a 200 unit limited edition Bluray! A FISTFUL OF PASTA 3 comical Cowboys set off on a perilous journey, climaxing in a three-way gun duel. DESPONDENT YEARNING A one night stand leads to romantic obsession and murder. HOMICIDAL An abusive father accidentally kills his small daughter and tries to cover up the crime. This sets the stage for a violent confrontation between the killer and his wife's boyfriend. INTERSPERSIONS 2 girls are living and a hippy lifestyle in a country house.but soon the walls between reality and fantasy start to blend until no one is sure what's really happening. The new bluray arrives Friday night 10/21/16 at 7pm EST. Missed out on Vol.1 ? Then GRAB VOL. 1 & 2 HERE NOW FOR A REDUCED PRICE!